Stylish hip clothing for less money is exactly what you’ll get with a discounted Hollister gift card! For 16 years this company has been offering young men and women cool wear and must have items for every season. Whether you’re shopping for yourself or someone else, this store carries all of your clothing and accessory needs. From undergarments and swimwear to jackets and coats, they have it all! And don’t forget: gift cards make a perfect present too! Tee shirts, flip flops, Cologne, jeans, and sleepwear are just a few of the things you can buy with a discounted Hollister gift card! Now, you can have the stylish clothes you long for, without breaking the bank! And with over 578 locations worldwide, you likely have one close to you. Purchase your card today and shop for hip clothes while spending less money! You really can look fantastic, without breaking your bank account! Not only will a discounted Hollister gift card save you money, but you can still use your coupons. Make sure you check out their selection of clearance and sales items for even more money savings. What’s more, you can join Club Cali and get exclusive birthday offers and other perks. And if you shop online you can receive additional savings & free shipping on all orders over $50. 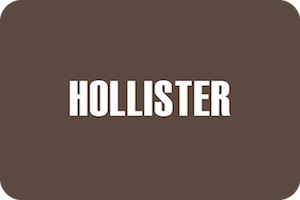 Not only will a Hollister gift card save you money, but we also offer discounts for other great stores! To save even more money, check out our listings for Abercrombie & Fitch, ALTAR’D STATE, American Eagle Outfitters, Aerie and more! Finally, you can save money on the stores you want to shop in! With Cards2Cash, saving money is easy! Do you have a Hollister gift card you’re not going to use? Cards2Cash will buy it from you and pay good money for it! Why keep a card you aren’t going to use when we give you money for it instead! Just stop in one of our retail locations for on the spot payment for your card or fill out our easy online form and we’ll get back to you with an offer you’re sure to love. Cards2Cash is your one-stop gift card shop!